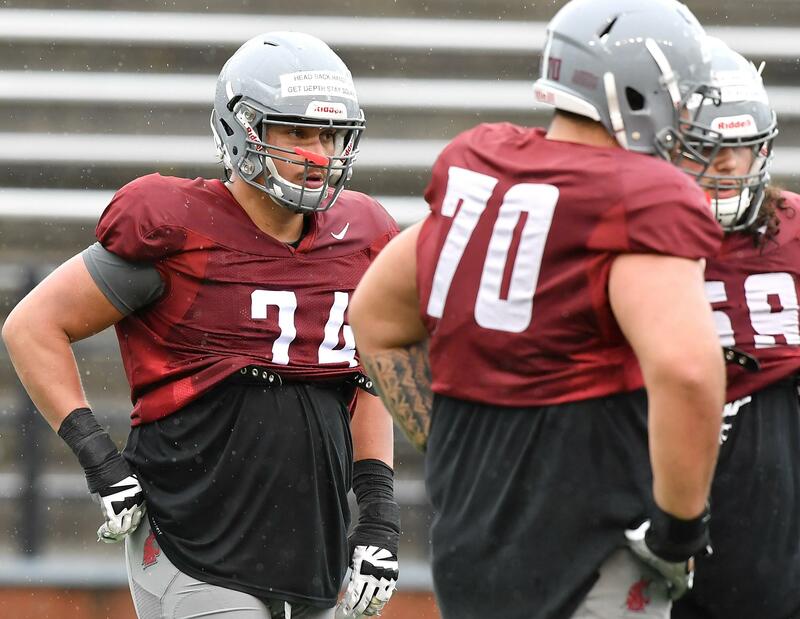 UPDATED: Fri., Feb. 15, 2019, 11:23 p.m.
PULLMAN – Robert Valencia made the first start of his career in what was supposed to be his last game at Washington State, but now the offensive lineman will have another year of eligibility to play with the Cougars. Valencia, a redshirt senior in 2018, announced Friday on Twitter that he’d been granted another year of eligibility. According to a Washington State official, Valencia was granted an extension of clock waiver because the school proved he had two years of denied opportunity. A former San Francisco City College offensive lineman who was once ranked the 11th-best junior college tackle in the country by ESPN.com and a four-star prospect by Scout.com, Valencia played in all 13 games for the Cougars last season, primarily on field-goal and PAT teams. The 6-foot-6, 300-pound offensive lineman was the primary backup to Josh Watson at right guard last season. He had his number called when Watson suffered an undisclosed upper-body injury before the Cougars played Iowa State in the Alamo Bowl. Valencia stepped in for Watson and didn’t miss a beat in WSU’s 28-26 victory against the Cyclones. For his efforts in the game, Valencia earned the team’s “Bone Award” – a weekly honor recognizing the team’s best offensive lineman. He also played sparingly in WSU’s games against San Jose State, Eastern Washington, Oregon State, Colorado and Arizona. Valencia enrolled at WSU in January 2017 but didn’t appear in a game during the 2017 season because of an undisclosed injury. He was taking first-team reps at right guard much of fall camp, but ultimately ceded the spot to Watson, a 12-game starter. With Valencia’s return, the Cougars not only bring back four of five starters from last season – left guard Liam Ryan, center Fred Mauigoa, Watson and right tackle Abraham Lucas – but a few key backups. Redshirt junior-to-be Christian Haangana played in all 13 games last season on special teams but also spelled Ryan multiple times at left guard. Published: Feb. 15, 2019, 11:21 a.m. Updated: Feb. 15, 2019, 11:23 p.m.